How many times have you turned the television on only to see one celebrity or another endorsing Greek yogurt? And how many times have you come across ordinary people who harp about the goodness of this rich, creamy superfood? If you’re the health-conscious type, I’m sure you’ve already eaten Greek yogurt. But there’s a high chance, that you’re unaware of how exactly it benefits your mind and body. How is it made? It’s pretty easy, really! Regular yogurt is heavily strained for a few hours to remove the whey and lactose, which leaves behind the flavorful, creamy Greek yogurt. Plain Greek yogurt has more protein, less carbs and sodium compared to the regular variant. Furthermore, Greek yogurt can be used in place of other fats when baking or cooking. Do bear in mind that certain varieties of Greek yogurt are higher in fat content and low in calcium. Plus, Greek yogurt comes at almost double the cost of its regular equivalent. We use Greek yogurt in few of our recipes, which not only makes our food great to taste, but also healthy to eat. It makes good sense to include Greek yogurt in your food. This post lists a few health benefits of eating it which are sure to make you take it more seriously. Because Greek yogurt is made from highly concentrated milk, eating it will provide you with more calcium per spoon compared to what you would derive from a glass of milk. This makes it a healthier option for maintaining your bone health, not just in the present, but also in the later stages in life. Be mindful about the brand of yogurt you pick, though. The amount of calcium present differs from brand to brand, and it is recommended you check the label before buying it to be on the safe side. Got a hunger pang? Eat Greek yogurt! When you snack on instant or processed food, you’re probably going to end up eating something that is high in fats, cholesterol and sodium. Basically, you’ll snack on something that’s completely unhealthy. Doing so will not only make you gain weight, but also affect your heart adversely. Greek yogurt, however, makes for a perfectly healthy snack with its low cholesterol and sodium content. Snack on it just as it is, use it as a dressing over your salads, or include it in your breakfast smoothies and parfaits. Eat to your heart’s content without worrying about harming it. Because Greek yogurt is fermented, it contains live and active cultures. Don’t get worked up over this as these bacteria are extremely beneficial for your digestive tract. The probiotics help the good bacteria that already exist in your digestive system flush out the harmful ones which have the potential to cause intestinal infections. Some varieties of yogurt also contain special kinds of probiotics which may help regulate your digestion and/or strengthen your immune system. Be careful while selecting your yogurt though, as there are certain manufacturers that subject yogurt to a post-pasteurization process, which kills off all bacteria, leaving it less nutritious than you would want it to be. Greek yogurt is loaded with vitamins and even a single serving can provide you with a considerable level of potassium, zinc, riboflavin, iodine, phosphorous, and vitamin B5. It also contains a good amount of vitamin B12, which is typically found in animal products such as fish and chicken. It is necessary as it helps regulate your red blood cells count and well as strengthens your nervous system. So vegetarians can load up on Greek yogurt to get their share of this elusive vitamin. Further, since vitamin D isn’t present naturally in yogurt, some brands may add it as it helps facilitate the absorption of calcium by the body. This too could benefit your bones. Ever had Greek yogurt for breakfast and felt content and satiated until it was time for lunch? I wouldn’t be surprised if you answered in the affirmative. Because it is protein-rich, it keeps your stomach feeling full for longer. 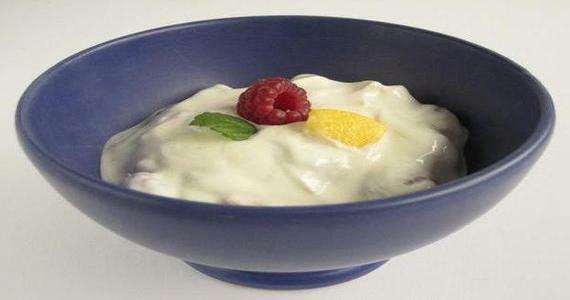 Having Greek yogurt may especially benefit those trying to lose weight. Just don’t add any artificial sweetener and/or sugar to it and it should hold you in good stead. One of the best things about eating Greek yogurt is that despite its sugar content, it doesn’t cause cavities. According to a research conducted by scientists at the Marmara University in Turkey, with the low-fat, light, and fruit flavors, it was found that none of them eroded the tooth enamel, which is supposed to be the main cause of tooth decay. Plus, the lactic acid which is naturally present in yogurt gives your gums added protection as well. So eat Greek yogurt and keep smiling! I hope the above points motivate you to include Greek yogurt to a greater extent in your diet. The truth is, not only is Greek yogurt more exotic than its traditional counterpart, it is also healthier. The great thing about it is that it shatters the myth that healthy food is tasteless. With it, you’ve got the perfect balance of taste and health. Eating will now be all about being happy and fit. So what are you waiting for? Get yourself some Greek yogurt today!